Imaging Specialists of Glendale has a close relationship with its referring physicians. We're committed to providing their patients with superior medical imaging, as well as improving the health and well-being of our communities. We work closely with our medical colleagues to ensure their patient's exam results are accurate and delivered as promptly as possible. To learn more about our skilled radiologists and the imaging services we offer, please reach out and talk to our dedicated team members. Request an appointment on behalf of your patient. We'll schedule their visit within one business day. Need to get a patient report right away? Call our office Monday–Friday 8 a.m. – 5 p.m. Referred a patient to us? Access their reports and images online with our referring provider portal. Our online provider portal, CONNECT, provides quick and secure access to your patients’ reports and images, as well as real-time updates on their exam status. Reports and images are available as soon as they are signed. Pages can be customized and filtered in order to provide convenient and easy access to all of your patient's records. Powerful Search: CONNECT lets you search patient records quickly and easily, including their exam history and all of their reports and images. Examine patients belonging to you or to other providers in your practice. Download and Print Reports: CONNECT lets you print or download patient reports so you can include them in your patient’s EMR record. 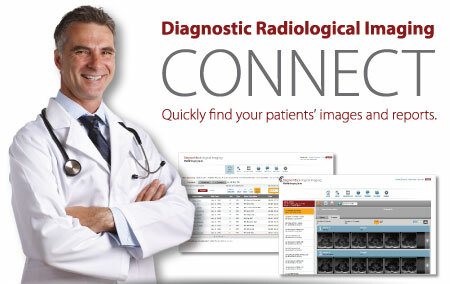 Image Viewers: CONNECT lets you view full DICOM images in your browser using convenient window-leveling, measuring, and scrolling controls. Reports: CONNECT lets you view your patient's reports using the portal, as soon as they're completed and signed. The Imaging Specialists of Glendale provides physician-centered care. We work hard to ensure our radiology referrals enjoy the highest levels of accuracy. We understand the importance of fast turnaround, dedicated support, and responsive service to medical diagnosis and treatment. When patients are referred to us, you can be certain they'll receive the best and most comprehensive radiological care available.